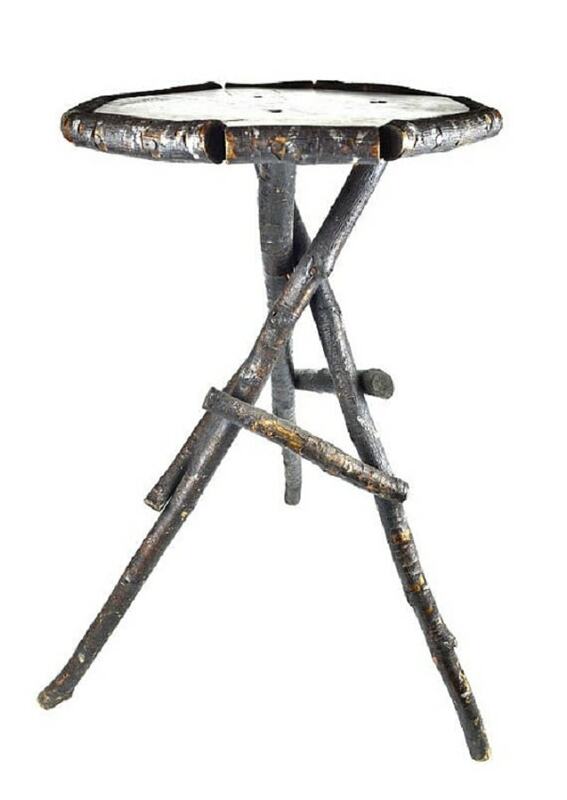 Are you looking for some good items that also have an artistic effect to help you to update your lovely kitchen? 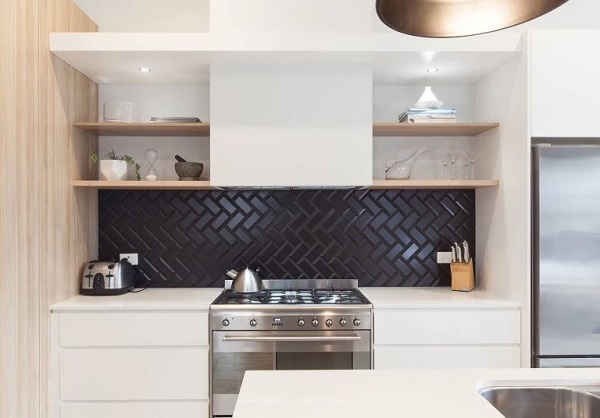 Surely, you as the homeowner really like to make an update and give some changes to the layout of your property, one of them is about kitchen appearance. As a suggestion, the small items can be a good choice for you to decorate the room, not only about saving the space but also it is kind of the details object of art. Here we have some lovely canisters with cool turquoise colors for you, they are useful and absolutely perfect to be an addition for you to complete the experience and the perfection of your kitchen area. You can choose which one is the right canister that suitable to your kitchen decor and accents below. This colorful flowers art pottery stoneware canister is one of the best vintage items that is really worth to beautify your kitchen. 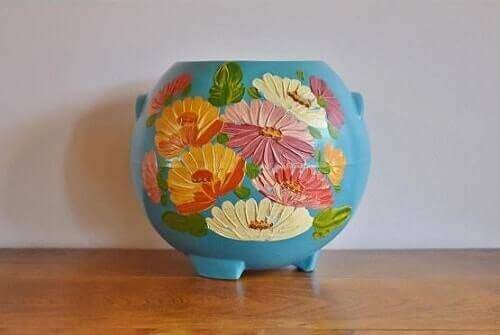 The first beautiful thing you will see at the first sight from this canister is its colorful and artistic flowers on the turquoise ceramic background. That flowers art is hand painted in purple, bright pink, bold, orange and cream that against that deep pretty turquoise background. You can also put this beautiful canister on the kitchen counter, it is because the canister will create such a refreshing atmosphere with its turquoise finish. Other things that make this beautiful canister become popular and everyone’s favorites are its cute handles and legs. A perfect choice for storing several small items in your lovely kitchen. 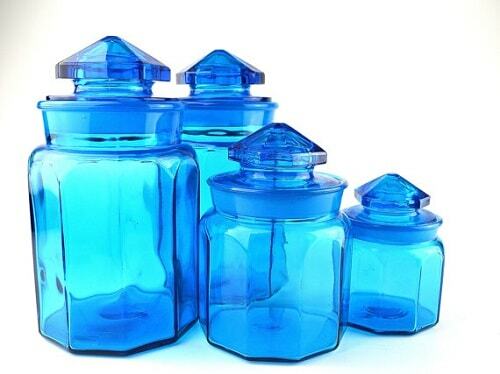 This colonial blue glass canister is a dazzling thing to decorate your kitchen area. The set includes 4 canisters in different sizes for your convenient storing. 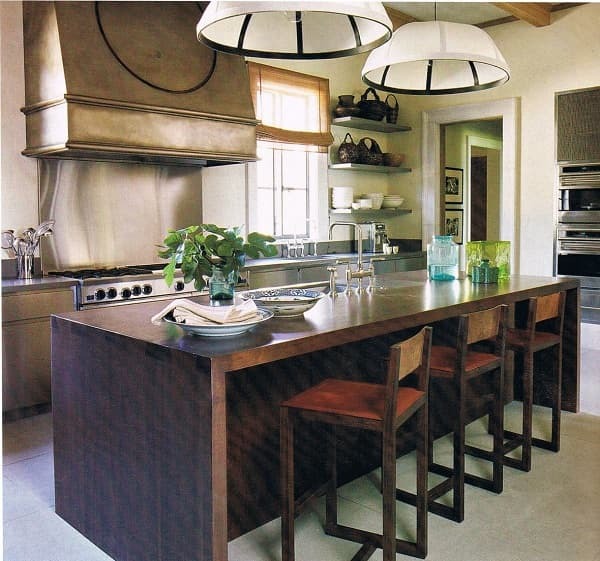 This 1960’s style kitchen feature is kind of vintage item that can add such a distinctive touch to the room. Its crystal blue color will give a nice and strong impact on your kitchen atmosphere when you put them in the right corner. The glass material is slightly transparent so you can see what kind of things inside. 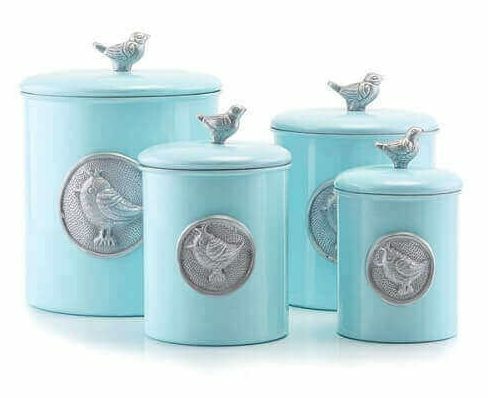 This gorgeous Old Dutch ‘Laurent bluebird’ canister set is one of the beautiful items that you should have in your kitchen. 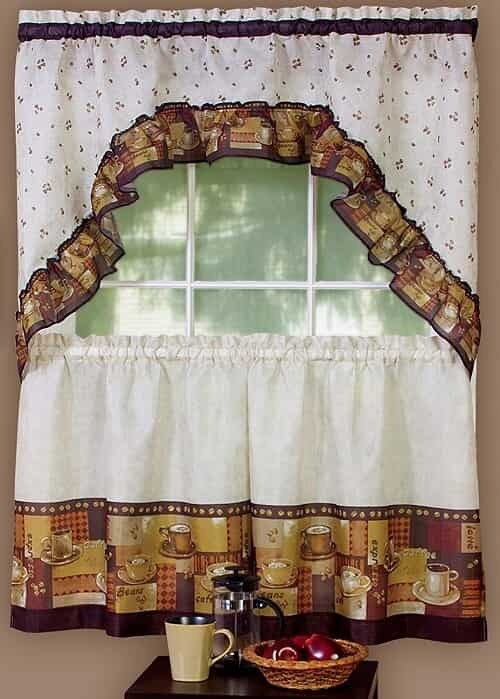 The beautiful color of this item will surely brighten up your kitchen look gorgeously, it is so suitable for the kitchen with calm theme and nuance. The silver birds on the top of canister cover are quite cute and have a modern touch of art. It has a steel construction and a fresh light turquoise finish as a background of that bird medallion and also handles. The set includes 4 canisters in different sizes with the different functions to store your kitchen stuff. 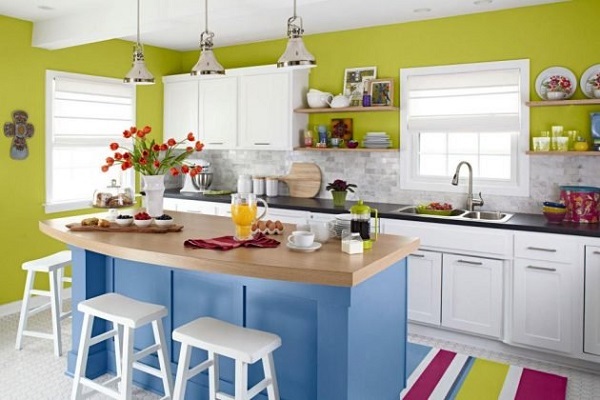 The turquoise kitchen canisters is really nice to place in any corner of your kitchen to update your the room’s decoration. The solid blue and turquoise color of this canister are an actual beauty of art. The dimension is 7″ tall x 5.5″ wide. 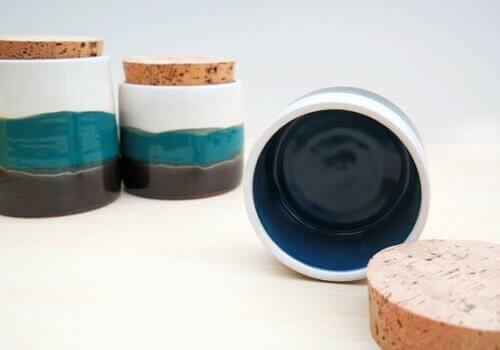 This handmade item canister is oven safe, food safe, and dishwasher-safe glazes. You have to know that the glaze on this product is simply perfect as they flow and break its lines and the lid pattern. It is easy to use or care and cleaning, because of the stoneware of this canister fired at 2200 degrees to create its durability. The bottom is signed and unglazed, and the materials of this turquoise kitchen canisters are food safe glazes and northern CA clay. 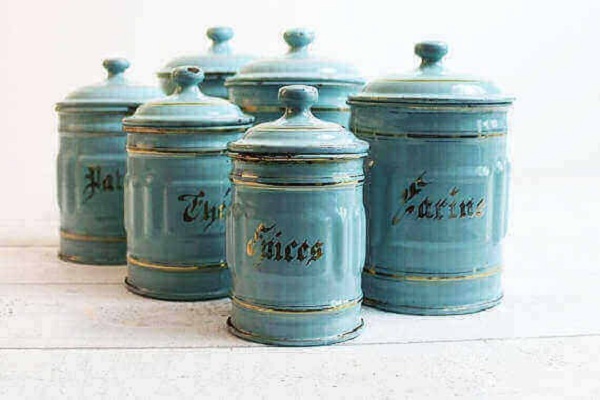 The next lovely canister is really suitable for your kitchen decor with a fresh blue turquoise color theme. But this one is different, it is not only dominated by the turquoise color but also you can find the white and natural brown accent from the top covers. 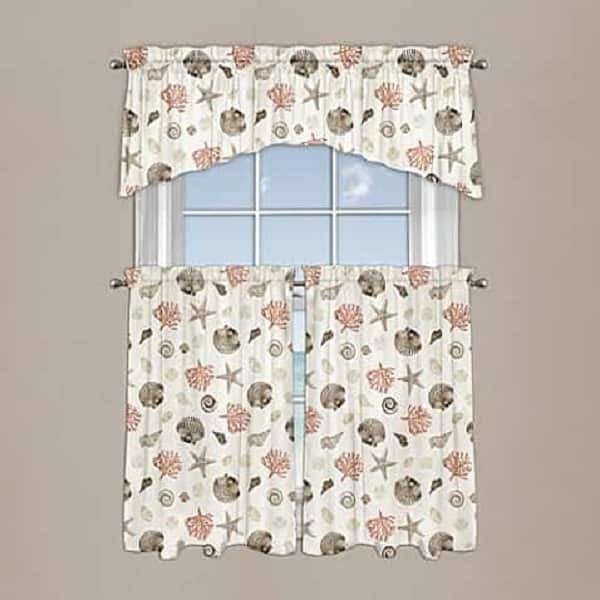 The material is clean and mod ceramic that has a Monte Sol pattern created by Portmeirion Pottery. There are vertical teardrop in purple, dark blue, and turquoise. The measures of this impressive canisters are 3.5” wide and 7.25″ high. 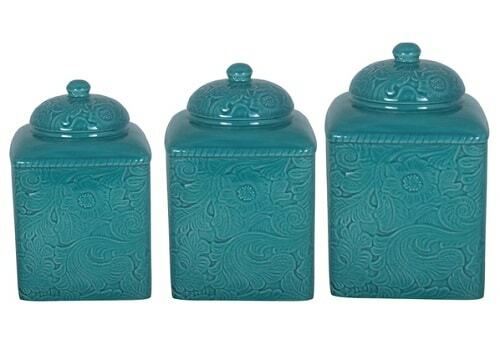 This High-end accents savannah turquoise canister set is the next impressive one that you should have in your kitchen. This canister is very fashionable and eye-catching, you can add new color, nuance, and life to the kitchen by placing it in a right spot. Not only as a good container, this canister also can be a beautiful little decor object to enhance the kitchen’s style. That three piece canister set is perfectly crafted of thick ceramics and a relief of floral pattern on it is gorgeous. You can put your baking ingredients or anything else into this fashionable canisters. 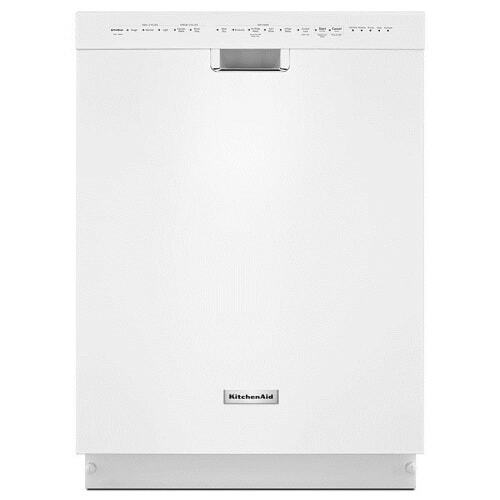 It is so worth it to buy, give a style for your kitchen. 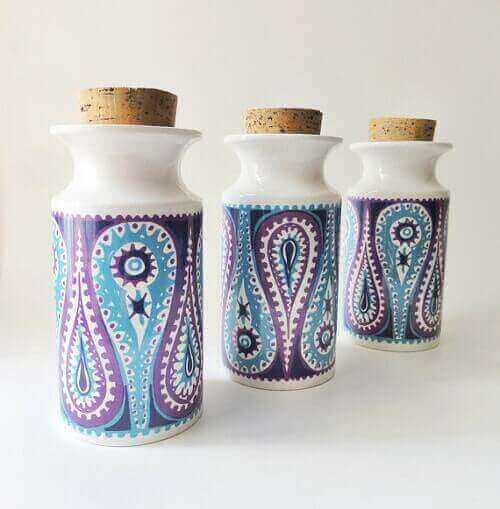 This ceramic turquoise kitchen canisters with cork lids has a beautiful and modern colors, a pure white from the top, a beautiful turquoise in the center, and a mystique black color in the bottom. This lovely wheel-thrown canister holds a good size of sugar and oats on the counter in your pantry. Actually, this beautiful canister is great for you, moreover, it is Dishwasher safe, but we recommended to do it by the hand-washing process to prolong the life of this product. Moreover, the canister is dishwasher safe, but we recommended to do it by the hand-washing process to prolong the life of this product. 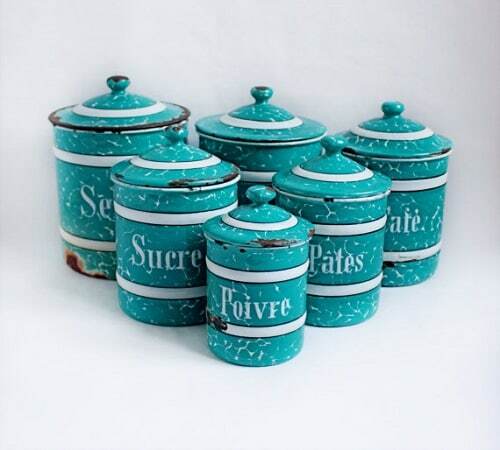 These Vintage French Marbled Enamel Turquoise Kitchen Canisters are definitely mesmerizing. This is very suitable for you who love the turquoise color. These 6 spice canisters have different words on it like you can see on that picture, it stars from the largest to the smallest one like a descending order, there are Café (coffee), Farine (flour), Sucre (sugar), Pâtes (pasta), Poivre (pepper), and Sel (salt). Moreover, if you really want to add some food to that place, we recommend you to use the aluminum foil for work nicely. 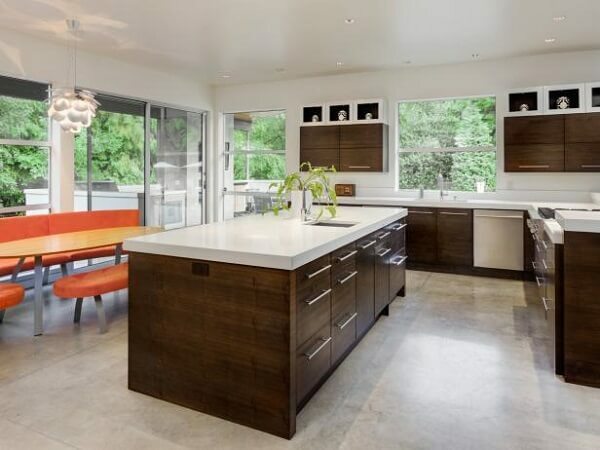 For kitchen counter or your shelf, it can be a good addition decor to make the look be better. 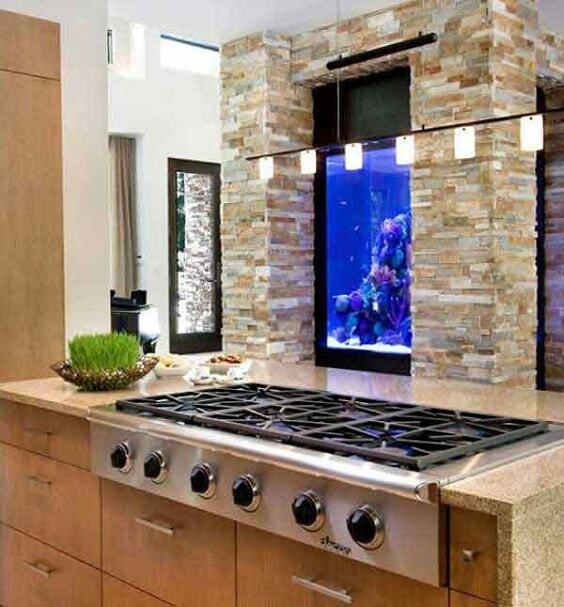 At the first time, you see these canisters, you will find the artistic and charismatic aspect of this kitchen thing. 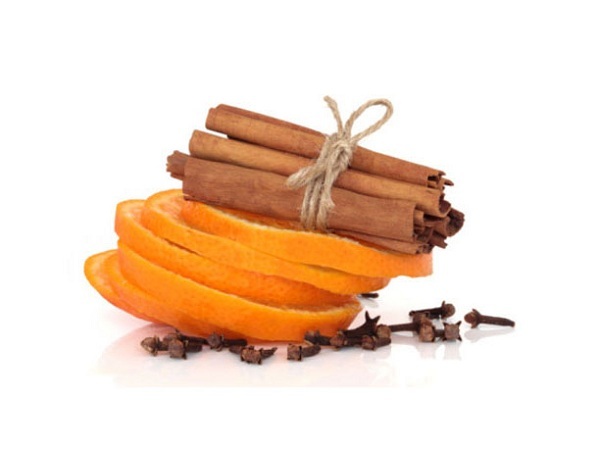 It can be a perfect addition to your kitchen decoration and enrich your cooking moments. Each canister has a lid on it. The largest size of this canister is about 13″H, and the medium size is 11″H, for the smallest one is about 8″H. Because this canister is kind of a handmade product, you will find a slight rich variation that makes these canisters unique. 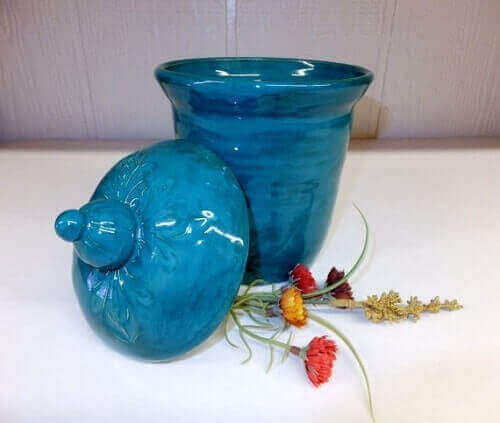 The materials that used of this pretty turquoise canister are food safe glaze and clay. In addition, the wooden spoons beside it are not included. 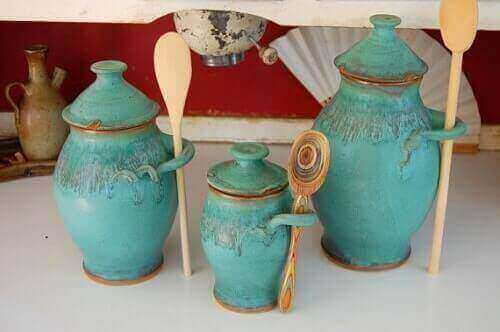 Then, those are some mesmerizing turquoise kitchen canisters that you can buy to decorate your kitchen. Choose which flows well with your existing decoration. 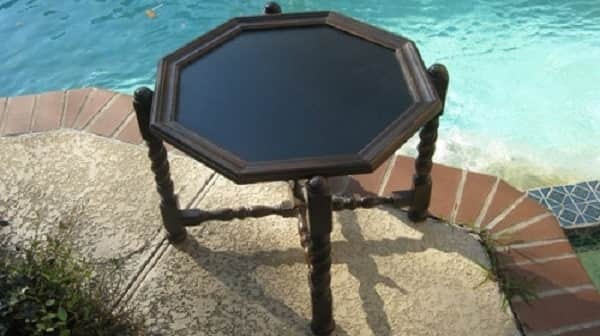 Most of the are made in the vintage style to create such a distinctive appearance to your kitchen. If you prefer to buy a used or handmade product, make sure that the quality is reliable, so you can use the canisters for a long time. Finally, happy decorating your kitchen’s layout!